Promotion 8/15 July and 22 August / 2 September reduced price compared to the normal price. The region of Agel is 'Minervois', a wild and far away from tourist part, very beautiful with a lot of wine and tipical mediteranean vegetation. The castle is from the XII century with an old familial atmosphere. 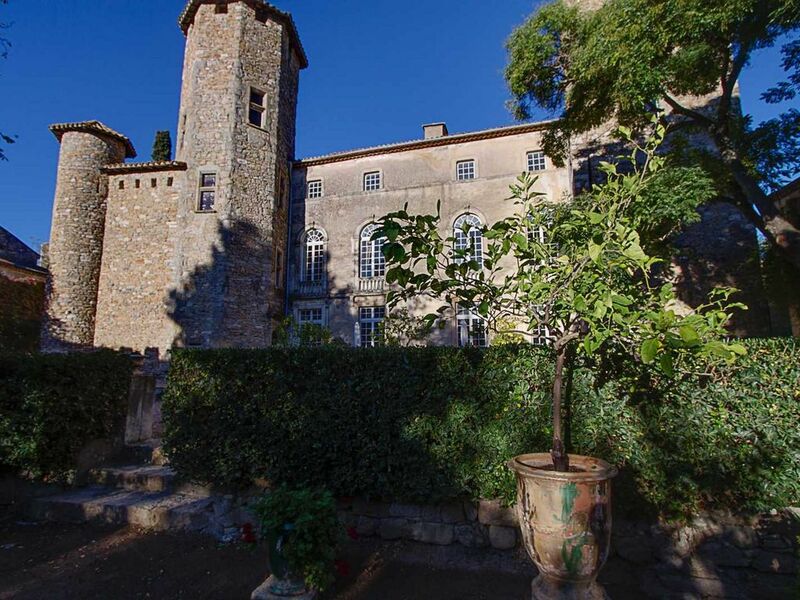 This medieval castle consists of the main building, four towers and a dovecote, extensive terraced gardens covering 2 hectares (5 acres) and a swimming pool. If you wish to find the ambiance from the past, you will enjoy the large lounges, the library, the spacious rooms the swiming pool and the park. For family vacations or vacations with friends, it is possible to rent the entire castle, the park, the pool. The castle have 2 living rooms, 1 library, 1 office, 2 dining rooms, 1 kitchen, 7 bedrooms, 6 bathrooms, a cave, park of 2ha. On the ground floor: a spacious entrance hall leading to the Great Hall, the small drawing room, the library with billard and the dining room, kitchen and lavatories. On the second floor: A large living room, a room for two people, a room for three people and 2 bathrooms. Possibility to have hosts’ table dinner (request 48 hours in advance). All bedrooms can be double room or twin bedrooms. Comfort : chauffage central – cheminée central heating – chimney. Communication : Satellite TV – DVD reader – Hifi – Internet ADSL. Domestic equipments: refrigerator – freezer – cooker – microwaves – electric coffeemaker – toaster – kettle – pressure-cooker – dishwasher – washing machine – dryer – iron – hair-driers. The owners have a self-contained flat in the back part of the castle. They are at your disposal for any practical or tourist information request. Having worked for several decades as a company executive then as a consultant in Paris, I settled in this small village of Agel a decade ago to undertake the restoration of the castle. The oldest part of the castle dates from the twelfth century. My family owned the castle since 1764. In 2005, we came to live with my husband in the castle that we have completely renovated while retaining the family furniture so that it keeps its soul and its charm. This castle is a beautiful authentic house full of charm, off the beaten track. It combines calm, comfort and tradition. The village of Agel is a very pretty village in the heart of a region of vineyards and tourist sites Cathars. Three bathrooms with shower and three with bath. All bathrooms have WC. All bathrooms have hair dryers, towels provided. Central heating: extra in winter. Change every week. Beds prepared for the arrival of the client. Several lounges are at your disposal + 2 televisions, a HIFI channel, a library with billiards. A dining room in the castle, a summer dining room in the castle orangery, two outdoor tables (each for 16 people). Board games, game of chess, ping pong, game of bowls, swing, trampoline ..
My wife, family and some friends stayed for one week at Chateau d'Agel in June 2016. Everything about our stay surpassed expectations and we truly hope to visit it again some day in the future. The owners Martine and Jean-Marie are the most pleasant and helpful hosts you could wish for, without being overbearing or intrusive. Chateau d'Agel also has its own wine label, which is reasonably priced and very good quality. Leave autoroute A9 or A75 by the exit for Béziers Ouest, direction St Pons. Then take the slip road marked Montady / Capestang (D11). Drive approximately 25 km to Cabezac. At Cabezac turn right towards Bize-Minervois (follow the D26 for 2km). At Bize, follow signs to Agel (take the D26 for 4 km then the D20 for 2 km). On autoroute A61 towards Narbonne, take the exit marked Lézignan-Corbières and follow the D611 towards Olonzac (11km). At Olonzac take the D52E3 for 2 km towards Beaufort. At Beaufort drive along the D910 for 10 km towards Aigues-Vives. At Aigues-Vives turn right towards Agel (3 km along the D20). Take autoroute A54 towards Nîmes, then autoroute A9 towards Montpellier, leaving at the Béziers Ouest exit towards St Pons. Then take the slip road marked Montady / Capestang (D11). Drive approximately 25 km to Cabezac. At Cabezac turn right towards Bize-Minervois (follow the D26 for 2km). At Bize, follow signs to Agel (take the D26 for 4 km then the D20 for 2 km). Visit Beziers, Narbonne with their cathedrals, the ancient walled city of Carcassonne, the ancient Cathar city of Minerve, the chateaux of Cathars, the abbaye of Lagrasse and the cistercian abbaye of Fontfroide. Take a drink along the canal du Midi or make a journey trip in the Montagne Noire, offering hiking, moutain biking, fishing. Attractions around Agel : tennis, bathing, parachuting, plane (your hostess holds a private pilot's licence), canoling, African reserve of Sigean.